"Help! Somebody, help!" The little girl who was crying for help had her leg trapped underneath a large rock. She knew that nobody could here her faint, quiet voice, but she continued to yell and scream all the same. Suddenly, off in the distance, a white flash caught her eye. The girl grimaced in pain, but curiosity took over. Tears stung her eyes but she swung her head in each direction, looking for the flash that got her attention. A loud nicker made her freeze. Did someone finally come for her? A rider from a near by ranch? No. The horse she saw was riderless, with no tack to show that he was tame. The horse was majestic, and he wore a beautiful white coat. 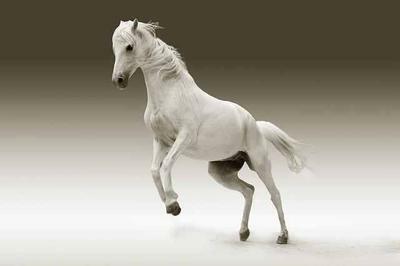 The "flash" that the little girl had seen was not lightning, no natural phenomenon, but this little white horse that had come to take an interest in her. A tear rolled down the girl's cheek; making a trail through the film of dust. The horse crawled closer. He pawed at the dirt and stretched out his neck. Nostrils flaring, he blew warm breath onto her face. The girl tried to smile, but the horse couldn't get her out of the situation she was caught in. Only a human being could push that rock over. The girl stretched out her hand toward the horse, and he sniffed it, wondering what little creature he had stumbled upon. But, suddenly, he ran off in the direction of the ranches and herds of cattle. Once again, the girl was alone. She buried her face in her hands and again tried to think of a solution. She thought of nothing. For hours she sat there, wedged between a boulder and the dry earth. She was starving and thirsty, and in a lot of pain. Her leg was certainly broken. The sound of hooves came from where the ghost horse had ran off to. Please, let it be help... the girl thought, trying to hold back tears. She glared in the direction of the thundering hooves, and a smile lit up her face. "Over here! I'm right here!" Two riders, one astride a dun and the other on a bay, strode toward her. The ghost horse was at there side, a safe distance away. "Mom? Dad?" The little girl recognized her parents at once. "Amanda? Is that you?" The stallion pranced toward little Amanda, neck arched. He raised his hooves high, as if trying to get attention. Amanda reached both arms towards her parents. "Oh, Amanda! I'm so glad you're OK!" Her mother enveloped her in a hug. The stallion became nervous of all the quick movement and loped off towards the plains. Amanda was free of the rock that was pinning her down, and now her and her family stared of in the direction of the ghost stallion, and her father said, "What an amazing horse. And to think he knew where to go to get help.."
Amanda knew, but she didn't say. All she thought about was that she was going to see that stallion again. Terrific start! I hope you'll continue. Be sure to submit part II as a comment here so we can read in order!